This entry was posted on September 12, 2017 by Jessica Anderson. Ready to host a Halloween Party? Get ideas at today’s blog post for hosting a Halloween Costume Party! I'm going to be tailoring this post to an adult party; If you want to read about kid’s party ideas, read my past post Prizes and Awards for Halloween Contests. 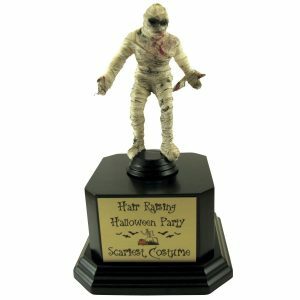 Our hand painted mummy trophy will be a hit at your Halloween costume party! Well Known Couples: There are thousands of combinations from history, pop culture or even items that go together (think Salt & Pepper, Peanut Butter & Jelly) I found great couples costumes for sale at Costume Craze to spark your imagination. TV Shows/Movies: Game of Thrones, Marvel characters, NFL Football, Walking Dead, anything popular could be included. Monster Party: Vampires, Werewolves, Frankenstein: everyone comes in a "dead" costume, with fake blood and gore. Star Trek vs. Star Wars: Epic battle for the best iconic (and nerdiest) Sci Fi space adventure! Nightmare Before Christmas: Make a creepy Christmas theme just like the movie. All About the 80's: Movies and Music. Think hair bands, Devo, Top Gun, 16 Candles; so many ways to get creative! 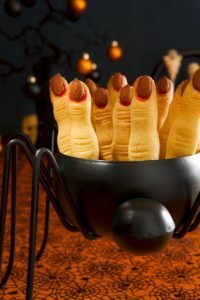 Halloween "finger foods" are easy to eat and don't require plates or utensils! I’m always a fan of food - and especially drinks - at a party. People get munchie and it's a great opportunity to reinforce your theme with creative snacks and cocktails! Food: Apps and small finger foods are always good to have as they are easy to eat and don't require plates and silverware. Punchbowl has a list of “finger food” recipes that are perfect for your guests to snack on. There are tons of cute Halloween food ideas online, Pinterest is a great source. Drinks: I'm always a fan of a tasty themed cocktail. Get “bloody” Halloween cocktail recipes here and again there's always ideas on Pinterest. It's really the best for finding fun drink recipes! Competition is a great way to get your guests involved in your party as long as you have a prize for the winner! We create many Halloween awards for “Best Costume” and here are some possible categories to include at your next Halloween party. Best Costume Categories Include: "Scariest Costume", "This costume fits my personality", "Cutest Costume", "Va Va Voom!" or "Sexiest Costume", "Most Creative Costume", "People’s Choice", "Funniest Costume", "Best Group Costume", "Penny Pincher", "Best Couple", "Most Original", and lastly "Cheesiest Costume". This year our Graphic Designer Lori N has created some awesome limited-edition, hand-painted Halloween trophies, perfect for your contest winner. We offer fabulous green witches, grinning jack-o-lanterns, wrapped mummies and creepy zombies! Also check out our custom Halloween medals, a perfect best costume prize! For more ideas, check out Halloween Party Ideas from Punchbowl, they have tons of great suggestions to get your creativity flowing. Also check out our Trophies2Go pinterest page where I’ve pinned cute decorating ideas, recipes, crafts and also my favorite trophies and medals for a costume contest. I hope your Halloween is full of treats, that's no trick!